Hello and welcome. You have taken a very difficult, but important, first step to exploring and helping yourself understand any difficult feelings, sadness or mood you may be experiencing just now. Smile and thank yourself for taking this first step. Something has happened to you to make you feel the way you feel. However, the good news is HAS happened , whatever it was, it is in the past, even though the emotions you are still feeling are making you feel the way you are. You may not know what it is, but usually it is something obvious, like a physical illness, an accident, a relationship difficulty, losing your job or a death of someone close to you. Curiosity and thinking about how and why you feel the way you feel is important to getting well can help you find the words to talk about it. Think about how you feel. Remember these are just thoughts about an upsetting episode or set of circumstances that have happened to you. It is in the past, but like burnt toast, the ‘smell’ is lingering. So try to smell something better. Think of a smell that you love or gives you a happy memory. A holiday, an achievement, a birthday, a night out, a compliment. The smell of your favourite food, coffee, fresh baked bread, cinnamon, lavender, your aftershave. If you want to think about the past. Think about someone who did something for you or helped you with something. Picture you saying thank you. Say thank you loud if you wish. Say thank you to yourself for doing something for someone else. Say thank you to yourself for getting here and seeking help and support. As you breathe think about the best thing you’ve done, the best place you’ve been or the best thing that has happened to you. Good things have happened to you and you have done good things, your mind has been dwelling on negative things. Breathe, think about right now. Your alive and breathing – that’s a very good start. Things can get better. Bad, sad and mad thoughts can come, like waves on a beach. the tide does goes out thought. As each waves recedes it builds a new wave, that wave can bring surprises. It’s amazing the amazing things that wash up on the shore. Like the sun setting and the dark arrives, remember the sun will rise again. Picture the sun rising at this moment. Just think about now, not the past, not the future. Smile, the past and future cannot hurt you. Its just negative feelings trying to hurt you. They will and do pass. Think about something that pleases you, that makes you laugh. This moment is yours, enjoy it. This moment cannot harm you. This site is not exclusively for men, anyone can use it, including people who may wish to know more about a partner, family member or friend who is experiencing difficulties with their thoughts and mind. During my recent episode – I’ve been very open with my partner, family and friends about the incidents of depression I’ve had over the past 20 years – my conversations with other men, revealed that many have experienced such things but found it difficult or embarassing to talk about it. It is not easy if your mind is , you cannot find the words to decribe how you feel. Men do find it much more difficult to admit to, and talk about, this kind of illness, even though 1 in 4 will experience some form of it at least once in their lives. You are NOT alone, even though you may feel like it. Many men, particularly young men, have experienced these types of illnesses but because it is not openly talked about, preventatively, this can only lead to a greater sense of isolation, ‘lostness’, desparation and sense of failure. Talking , ot typing here through the Contact Form, gives you a first step to talk, or in this case type about how you feel. Before you read any further, and especially if you are feeling anxious/depressed or agitated at the moment, try a very short 1 minute exercise to try to help to calm and clear your mind, even if just a little. Give your mind a break from itself. .
Find somewhere as quiet as possible, where you won’t be disturbed, to sit, on a chair, lie on the bed or settee, in the bath (empty!) As long as your back is and you are comfortable and warm. If you lie down, you may fall asleep – which is OK – just make sure its safe to do so! Focus on a spot on a wall or object. Half close or gently completely close your eyes. Let any thoughts come and go, just don’t dwell on them. When you reach 60 gently open your eyes and just be aware of how much calmer your feel, after just a minute. If you wish repeat this once or twice to significantly increase the benefits of a calmer mind. Admitting, not just to your self, but especially to someone else, that you are experiencing prolonged troubling feelings and emotions, even anonymously and confidentially (on a site like this) is a very good and important first step to helping yourself to get the help and support you might need to feel better. I found talking about how I felt, largely to my partner, really helped me. Talking to other men openly suddenly seemed to allowed them to talk openly about their experiences too, even if under whispered breath and side-ways glances on the street , in a shop or in a bar. I realised I was far from alone in feeling like this. Talking about it, sharing your experience can lead to getting your own insight, the right support, treatment and hopefully recovery or finding ways to live much better with it. It can be such a help to others as well. 6% of fathers in the UK have mental health illnesses at some time. It seems men are more likely to avoid the topic altogether. This seems to come from it being seen as a sign of weakness, not masculine and some sense of failure and/or shame. You wouldn’t be ashamed of getting any other illness, like the flu, a back problem, a broken bone or cancer, so there is nothing to be ashamed about in developing an illness of the brain. Part of the problem seems to be the stigma, sense of shame or some bizarre sense of loss of masculinity developed around discussing term mental health. The use of the word ‘mental’ as a derogatory term certainly does not help. I describe my condition as a brain illness. It used to be the same about cancer – the Big C – as it it were rare or the plague. In 2013, there were 6,233 suicides in the UK, 78% were male. There are still many stigmas and taboos about these illnesses, partly because from the way men talk or don’t talk about it. The more we talk, the more we break the taboos and stigma. The stigma about such illness still makes it very difficult to overcome fears and tell people. Hence the name of the site. Telling someone helps us admit we are not well and is the first step to getting the right information, professional support, understanding from family and friends to help recovery. This web space aims to help provide some basic information, support resources and ideas, as well as a safe, anonymous space to communicate anonymously with others to reduce any sense of isolation, loneliness and difficulties you or someone you know may feel in communicating. A place you can begin a ‘conversation’, to overcome any initial worries you may have about ‘talking’ about how you feel. Many, especially men, may see it as weakness to talk about such things. 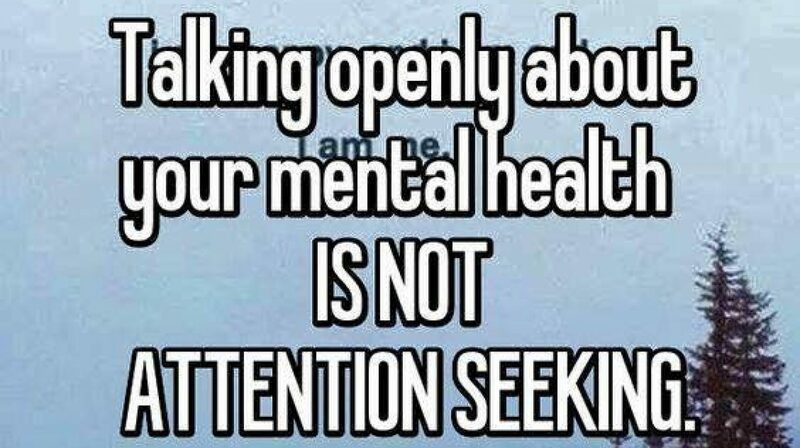 With a troubled mind it actually takes great strength and courage to talk about illnesses that can’t be seen or easily explained. It can be very difficult to find the words for the ‘pain’ and to express and explain what you are feeling, even and especially to those closest to you. Worrying (ruminating) and anxiety that can lead to depression – some useful background on this. I hoped this site will grow through your thoughts, experiences and concerns. I have produced some initial blogs and resources that may be useful to you. You may wish to comment on them and add to them. You can use the Contact Form to get in touch if you wish. It’s entirely confidential. The site provides initial information and experience to support yourself and other men who may have mind illnesses or want to support a male family member or friend who may have a mind illness. Any comments, including constructive criticism, advice, information and experiences would be very welcome from you. Please go to ‘About’ and ‘Information & Resources’ pages, by clicking on buttons above on web page header, to find out more if you think you or a male friend may be struggling from an illness of the mind and want to find out more, and in particular want to contact, by anonymous post, someone in confidence, who has experience of what you, or they, are going through. This is not to be a replacement for visiting your GP or getting other professional help from counsellors, therapists and psychiatrists as necessary. This may provide some safe space for your to have your say, to express yourself and through that maybe support others as well as yourself. You may find some useful information and other related sites under the Resources section. Whether you end up using or contributing to this site or not I wish you well. You are not alone and talking or writing down your thoughts and feelings with others can help as a first step and I appreciate it can be a difficult first step. Be well. Moving on Up, Moving on Out – Nothing Can Stop You! Happy endings or Happy Beginnings? Tuesday 5th December 2017 Well, maybe, maybe not, at you in this moment. But its possible. But in the words of another song, ‘What a difference a day makes. ‘Three weeks ago, I awoke to my first non-anxiety start to a day in 12 months. This was such relief. There his hope. Holding on … Continue reading Moving on Up, Moving on Out – Nothing Can Stop You! Happy endings or Happy Beginnings? Progress? One step forward and two back. 8th November 2017 So what’s been happening. Well quite a lot, hence the absence of a blog. I’m still waiting to see someone to talk to about how to get better. That’s 10 months now since my first CBT session! (It was cancelled on referral to a psychiatrist, that took 12 weeks wait to see). … Continue reading Progress? One step forward and two back. It’s September now and the NHS and DWP merry-go-rounds still have me in their grip – mostly waiting for support and advice. 30 years of tax paying and NI contributions have led to a position of having to wait 16 weeks for counselling and little practical support as yet to get back into work. I … Continue reading One step forward and two back? I write this new blog more out of frustration, than anger, and as an example of what someone with a mental health illness might face and what I consider options and approaches when faced by the all too daunting and unnecessary complexity in, and pressures on, the NHS. It highlights the need for considerably more … Continue reading Mental Health Services?